Chechen warlord Shamil Basayev is no stranger to violence. In the turbulent world of the northern Caucasus, Basayev has fought in the Abkhaz rebellion of 1992-93, and played a central role in the first Chechen war of 1994-96, the invasion of Dagestan in 1999, and the current conflict in Chechnya. In addition, he received training in guerrilla warfare and covert operations from both Russia and Afghanistan. There is no question that Basayev is one of the most experienced and dangerous practitioners of “asymmetrical warfare” in the world today. It is often said that the suicide truck-bombers of Iraq have adopted Palestinian or al Qaeda tactics, but it was Basayev who perfected the procedure in a series of attacks on Russian targets that began in 2000. Today Basayev declares himself at war with Russian “state terrorism,” alleging genocidal intentions on the part of Moscow. Once an exponent of purely military tactics against the Russians, Basayev has openly embraced the tactics of terrorism in the last year, seeking to provoke a catalytic event that would free Chechnya from Russian rule. The shift comes from the recognition that the Chechen resistance can no longer mount mass assaults like the one on Grozny that ended the first conflict in 1996. 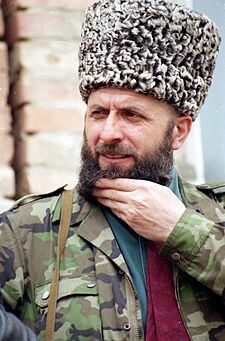 “Our mission today is to give the invaders a good kick to push them to withdraw, and, God willing, we will do that!” His dismissal from the Chechen command structure after admitting his complicity in organizing the infamous hostage taking at a Moscow theater in October 2002 appears to have liberated Basayev from the necessity of harmonizing his words and actions with those of the beleaguered Chechen president, Aslan Maskhadov. In response to the atrocities carried out by Russian security forces in Chechnya, Basayev remarks: “Today we can see on TV how rapid-reaction units and special-purpose police units are getting dispatched (to Chechnya), and how their wives, their sisters and their mothers are wishing them a good trip. We will be conducting operations right in those cities and villages where they came from.” This declaration follows a decision taken by Basayev’s Riyadus Salikhin Brigade of Martyrs to undertake “Operation Boomerang,” applying the principle of collective responsibility to the Russians, just as the Russians apply it in Chechnya by carrying out retaliation attacks on the families of Chechen resistance fighters. “Collective responsibility” has long been an established policy in Israel’s war on terrorist formations, and the United States has recently been accused of applying the policy in Iraq (in violation of the Geneva Conventions) through arrests of family members of suspected resistance members and the destruction of their homes. On August 4, 2003, U.S. Secretary of State Colin Powell designated Basayev a threat to U.S. security, adding that Basayev “has committed, or poses the risk of committing, acts of terrorism” against America. Before the American intervention in Afghanistan, Basayev rarely commented on the United States, other than to criticize its lack of support for the Chechen struggle. Since then, however, Basayev now refers to “Adolf Bush,” and describes America as a mirror image of the Roman Empire, thrashing out against “the barbarians” as it collapses from internal corruption and moral decay. Unlike many Islamists, however, Basayev denies that the United States is engaged in an anti-Islamic “crusade.” “There is nothing crusading in America’s actions. This is a satanic campaign against the entire world, against anything sacred in this world, against Islam, against Christianity, against Judaism–it is… the attack of godlessness and Satanism against the Faith on all fronts and all levels under the guise of all sorts of slogans.”  Basayev also adds that the removal of dictators like Saddam Hussein will benefit Muslims, giving them the chance to rise together in unity. Saddam, a vocal supporter of the Russian campaign in Chechnya, is little missed in rebel circles. The tactics of terror are, of course, nothing new to Basayev, who first came to attention as an airplane hijacker in 1991. Since then he has planted radioactive material in Moscow (as a warning), seized a hospital with 200 hostages in Budennovsk, and executed Russian prisoners after the Russian army failed to exchange alleged war criminal Colonel Yury Budanov for the men (a decision Basayev and Saudi warlord al-Khattab claimed was fully justified by Islamic law). In November of 2002 Basayev warned the NATO nations of the havoc he intended to wreak in the Russian interior, outlining the cost to the Western world of a Russian collapse. Hampered in mobility by multiple wounds and the amputation of his foot, Basayev nevertheless remains capable of mounting deadly strikes at Russian targets. Despite being declared a threat to American interests, Basayev appears to be satisfied with verbal jabs at the West for now, choosing to remind the West of its complicity in the coming violence through its support of President Putin. Mahathir Mohamad, quoted in Tomi Soetjipto, “Mahathir lashes out at state terrorism, WTO,” Reuters, October 22, 2003. U.S. Department of State: Public notice 4436: Determination Pursuant to Section 1(b) of Executive Order 13224 Relating to Shamil Basayev. “Interview with Basayev: Jihad is only starting to flare up in Ichkeria,” Kavkaz Center, June 9, 2003. “Aslan Maskhadov: After “Nord-Ost”, Basayev has been acting on his own,” Interview by Novaya gazeta, October 2, 2003; at www.chechnya-mfa.info/print_press.php. “Statement of the Amir of the Islamic Brigade of Shaheeds Riyadus Salikhin, Abdallah Shamyl Abu-Idris (Shamil Basayev),” Kavkaz Center, January 12, 2004. “Arab commander says Chechnya war to spread to rest of Russia,” Al-Jazeera, November 19, 2003 [BBC Monitoring]. In a rare public statement al-Walid has also called on Iraqis to use suicide bombings against Coalition forces in Iraq: Muhammad al-Shafi’i, “Abu-al-Walid Al-Ghamidi, Commander of the Arab Fighters in Chechnya, Advises the Iraqis To Store Weapons and Stage Suicide Operations,” Al-Sharq al-Awsat in Arabic (London), June 11, 2003. “Zakaev: Basayev Is Not Clearing His Actions With Maskhadov,” Moscow Grani.ru, June 15, 2003. “Chechnya: Aslan Maskhadov’s appeal to put an end to the war,” Le Monde (Paris), October 3, 2003. “Statement of the Amir of the Islamic Brigade of Shaheeds ‘Riyadus Salikhin’, ‘Abdallah Shamyl Abu-Idris (Shamil Basayev),” Kavkaz Center, January 12, 2004. This article first appeared in the February 26, 2004 issue of the Jamestown Foundation’s Terrorism Monitor.